The items below are included from the Evrris catalogue for those members who take an interest in the welfare of the green we are bowling on. Note how much the weather, water and sun play in these. Now you know a lot more than you did before! This occurs mid—spring to early autumn when an extended period of leaf wetness will encourage the disease. Warm day temperatures and cool nights add to susceptibility. Most likely when Nitrogen fertility is low and growth is poor. Varieties of red fescues, particularly slender creeping red fescue are the most susceptible grass species. Also those fescues found in sea—washed turf. The main symptoms are numerous small (no more than 50mm) bleached spots which may coalesce to form larger, irregular patches. Infected leaves appear water-soaked at first, then bleached. Leaf lesions have a characteristically bleached white centre with a eddish—brown border. White ’cotton woo|' mycelium may be noted in early morning.Recovery is usually rapid, as roots are not affected. Maintaining adequate fertility is ften the easiest method of preventing attacks of Dollar Spot. Fungicides such as Banner Maxx ill give good control of Dollar Spot. Fungi primarily colonise thatch at the turf base and/or organic matter within the soil, sually caused by an infrequent watering and fertilizing regime. The rings of stimulated grass growth are the result of Nitrogen released in the soil by the Fairy Ring's activity underground, breaking down organic matter to release ammonia, which is then processed by soil microorganisms into Nitrates. 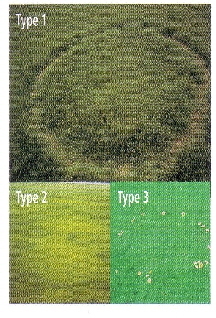 There are three Types of Fairy Ring. 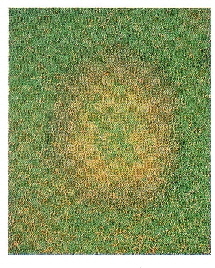 Type 1 Fairy Rings (the /Warasm/us oreades fungus) typically appear as a ring of dead or stressed turf, bordered on both inner and outer edges by a band of stimulated grass growth. New rings can appear just as green 'patches'. It is prevalent in hot, dry conditions and may cause turf death by soil water repellence and/or toxic substances. Type 2 Fairy Rings (Agaricus spp. and Lycoperdon spp.) of stimulated grass growth are seen normally without fruiting bodies. It is rare that excessive damage is caused to the turf. Type 3 Fairy Rings (Hygrophorus spp.and Psilocybe spp.) have no distinct affect on turfgrass except when the fruiting bodies are present (normally during the autumn) when they form rings of mushrooms or puffballs. These obviously affect the quality of the sports surface. Heritage Maxx is approved for use on Type 2 Fairy Ring. This occurs late autumn and early spring during cool humid weather, high Nitrogen fertility and on thatch poorly drained soil. The disease is discouraged by high Potash and Sulphate levels and acidic conditions. 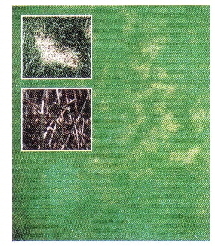 The main symptom is rapidly developing circular patches of 25-50mm diameter. Leaves become brown and mushy. Sometimes pink or white cobweb-like fungal threads can be seen in early morning. To control Microclochium Patch — promote good turf management. Your aim is to promote healthy, vigorous growth. Fescue and Browntop bents are much more resistant to the disease. Moisture control to avoid humid surface conditions will do much to prevent disease attack. Regular aeration and careful application of fertilizers with an appropriate sandy topdress will make the surface less moisture-retentive. Reducing water holding thatch is also beneficial. The return of clippings provides a substrate for disease development, so catch and remove the grass. Care should be taken when applying fertilizers as excessive Nitrogen combined with cool wet weather can lead to severe disease outbreaks. The use of lime on fine turf is only recommended under exceptional circumstances. Medallion TL, Banner Maxx and Heritage fungicides are effective against this disease. This can occur anytime of the year, in shady, poorly aerated, compacted soils and a lack of Nitrogen. Particularly summer and autumn under warm moist conditions. The main Symptoms are irregular patches of light brown or bleached leaves covered with distinctive red threads. Pink patch lacks the characteristic 'Red Threads'.instead leaves may become coated with pink mycelial growth. 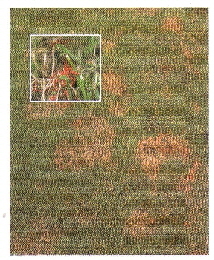 Whilst red thread may occur alone, it often occurs as a disease complex with pink patch. Severe outbreaks may kill the grass but generally affected turf will recover adequately. All turfed areas are susceptible to excessive thatch and it can occur throughout the year, but is most rapid from October to December. Excessive thatching can be induced by heavy liming. Circular patches up to 500mm in diameter can form where the surface of the green sinks due to decomposition of the thatch layer. 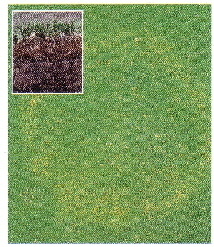 Sometimes turf in the affected areas undergoes a colour change to a darker green or yellow. The affected thatch may also change colour, to orange, whitish or black. White mycelium may also be visible in thatch. Physical causes of thatching may be alleviated by additional aeration on the areas worst affected. Commercial wetting agents, e.g. H2Pro and Qualibra, specifically designed for use on turf are available from Everris. Wetting agent applications should begin at the start of the growing season.